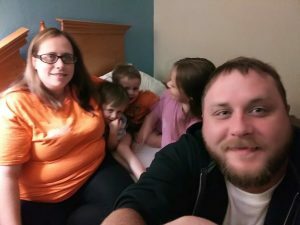 My partner Torie and our 3 children are currently living in a hotel after moving to the area from a homeless situation in Mississippi. I recently started work. We applied for long term housing but were denied due to credit issues. We are continuing to look for long term housing and are also talking to SSVF but it will be a few weeks before we are able to receive any help with long term housing.